MacX DVD Ripper Pro is world's first DVD ripper for Mac that truly applies 3-Level GPU hardware acceleration tech to dramatically speed up DVD ripping 5X faster than before. It outperforms other competitors to be the fastest DVD ripper for Mac by having hardware decoding, processing and encoding accessible on machines configured with QSV Intel processor/Nvidia/AMD GPU processor. Just 5 minutes to rip a full DVD on Mac hard drive. Additionally, the Mac DVD ripper reinforces the leadership in the converting field by affirmatively and timely triumphing over all knotty DVDs, including AV DVDs, workout DVDs, TV series DVDs, unplayable DVD and even the new and 99-title DVDs. Fast DVD ripping speed is considered one of the crucial factors while digitizing a DVD. Although the ripping time is partially dependent on the size of DVD and the computer specs (mostly CPU and GPU), it has a lot to do with the DVD ripper itself. Averagely, a DVD ripper takes about 40 min for every single disc ripping. I bet you won't want to sitting around your Mac for the lengthy transcoding, especially when you have collected hundreds of extensive DVD discs and wish to build your DVD digital library one-off. 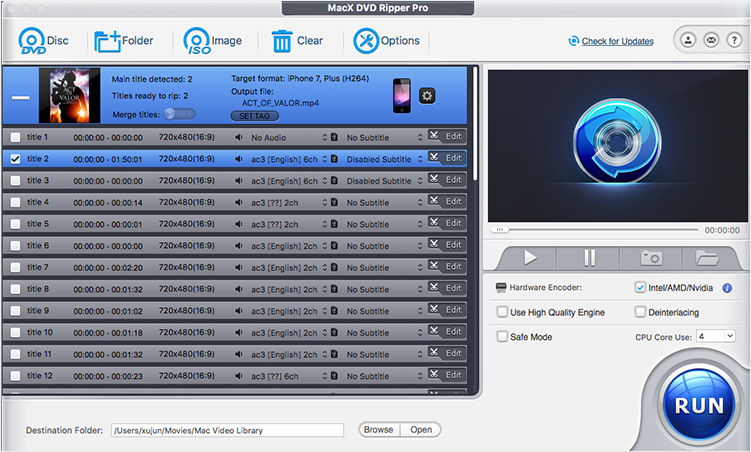 If you want a fast DVD ripping solution to save your precious time, here we will review the fastest HW accelerated DVD ripper - MacX DVD Ripper Pro v6.0.0, along with the speed test and comparison with other top rated DVD rippers for Mac. Well, first things first. Why is this hardware accelerated DVD ripper ranked No.1 fast? How does HW acceleration affect DVD ripping speed? You're suggested to read the below illustration if you have no idea about hardware acceleration. Or jump directly to Part 2 if you know a thing or two about it. Part 1: How Does HW Acceleration Affect DVD Ripping Speed? 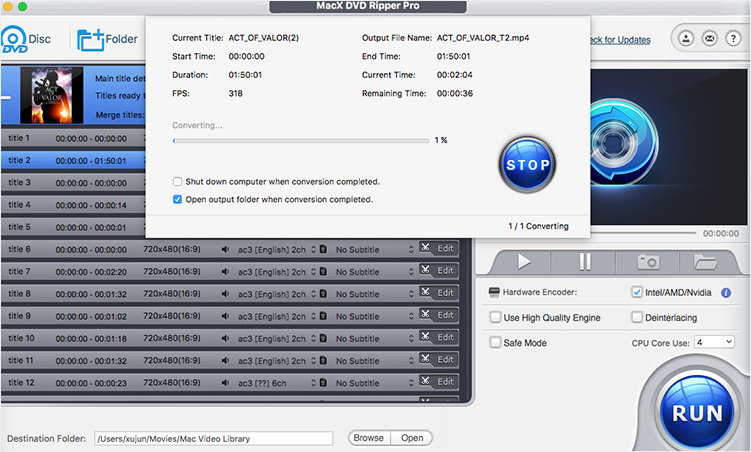 MacX DVD Ripper Pro is built in a powerful transcoding engine at the heart. Specifically, it applies high-quality engine to ensure the highest possible quality after DVD ripping, and utilizes the innovative multi-core CPU tech (support up to 8 cores) and hyper-threading techology to make full use of CPU for instant DVD conversion. That's not enough. DVD ripping is a time-consuming process and meanwhile a compute-intensive task, as well. To make your DVD ripping faster and more lightsome to your desktop, MacXDVD further optimizes MacX DVD Ripper Pro with the advanced hardware acceleration techs Intel® QSV/Nvidia/AMD so that you can, for example, make the utmost of your computer hardware configurations (esp. GPU processor) to hardware decode, process and encode DVD to digital formats at much faster speed than before. Yet, how does hardware acceleration affect DVD ripping speed? Well, you might need to spend 1 minute here reading the below concise explaination and you will be instantly enlightened. It's known to all that the general DVD ripper software mainly applies its software decoding and encoding capabilities into DVD ripping process, no speed advantage. Things become much better when DVD ripping relies on 3-Level hardware decoding, processing and encoding (instead of merely software transcoding), especially hardware accelerated DVD ripping on GPU processor. That's because GPU (graphics processing unit), with SIMD architecture and throughput oriented design, is dedicated in large-scale parallel processing, which is beneficial to dramatically shorten DVD conversion time. DVD ripping is exactly the process involved with compute-intensive parallel processing. Therefore, the DVD ripping speed will be much faster than before if both your DVD ripper software and computer support GPU hardware acceleration technologies. The most popular hardware acceleration techs include Intel QSV, Nvidia and AMD. Essentially, they're all designed with the same purpose: take full advantage of dedicated media capabilities of GPU to handle DVD ripping and conversion task and ease the burden of CPU for more tasks to ensure a better responsiveness. A slight difference lies in that Intel Quick Sync Video is embedded into Intel Core CPU processor and integrated graphics while Nvidia and AMD are the discrete graphics cards to perform the GPU hardware acceleration. You can install more than one discrete graphics card to further improve DVD ripping speed if your computer hardware configurations are good enough. Of course, to activate the acceleration, there are some entry-level requirements for your computer hardware configuration. Check the full guide of hardware acceleration to see if your desktop supports 3-Level techs. You can eventually utilize these GPU acceleration techs in DVD hardware decoding, processing and encoding once you fire up MacX DVD Ripper Pro on your HW acceleration supported computer. And then have the chance to experience the several times faster DVD conversion speed than before. How fast does this HW accelerated DVD ripper run on earth? The following speed test will give you the answer. This innovation transfers a large part of the DVD decoding, processing and encoding to graphics chip, thus unburdening your CPU for other tasks and therefore boosting the ripping speed - up to 5X faster - for ripping DVD to MP4/MOV/M4V H.264. This accordingly delivers up to 5-8x quicker conversion for iPhone, iPad, Android and other portable devices, and freeze-free work on your computer during DVD ripping. Below is the side by side DVD conversion speed test between the HW encoder enabled ripping and normal DVD ripping. •	Tests carried out by MacXDVD Software. Computer specifications: macOS Sierra (10.12); 4.0GHz quad-core Intel Core i7; 2TB Fusion Drive; Intel Iris Pro Graphics 6200. •	Hardware encoding performance also depends on the size of DVD and computer configuration. A highly configured computer brings about fast ripping performance. •	Disc name: A Touch of Frost; Duration: 01:33:34; File Size: 4.1GB . Part 3: Does Your DVD Ripper Support 3-Level HW Acceleration? The above test shows that the HW acceleration enabled MacX DVD Ripper Pro can rip DVD movies at 5X faster speed than HW-disable mode. This should give the credit to MacX' 3-Level GPU acceleration techs - hardware decoding, processing and encoding, activated by its internal Intel QSV/Nvidia/AMD GPU acceleration techs. Well, some of you, esp. laymen, may be strange to the 3-Level hardware acceleration and wonder the differences among 3-level, 2-level and 1-level HW acceleration. To help you better understand them, here we make an overall comparison and list out the world-class GPU accelerated DVD rippers in the current market. DVD video encoding is the most compute-intensive part in the whole DVD conversion procedure and would consume large amount of CPU usage and power if DVD video encoding purely relies on CPU processor. That partly explains why almost 90%﹢ DVD ripper software supports GPU hardware encoding DVD movies to H264 format to ease CPU burden. It's no more a secret for DVD ripping procedure. After the DVD encryption tech is removed by your professional DVD decrypter, the DVD conversion enters the next phase - DVD video decoding. It used to apply software decoding to decode DVD file data with restricted speed (affected by DVD ripper software DVD conversion engine and algorithm). Speed gets much faster when it applies GPU hardware decoding in DVD ripping, at least 1X faster than software DVD decoding. To further boost DVD conversion speed, hardware encoding comes into play in the following work, improving speed up to 2-3X faster . The only drawback is that the 2-Level HW supported DVD rippers are less than 50% of the DVD ripper industry. Between DVD hardware decoding and encoding, there is another phase called DVD video processing, the top priority of which is to deal with the DVD post-processing tasks, including deinterlace, 3:2pulldown, doppler principle, DVD video scaling, brightness, etc. Though DVD video processing is nowhere near as high-demanding as DVD video encoding, it still occupies a lot in CPU usage and places certain burden on CPU processor. Therefore, hardware processing also matters a lot to tremendously improve DVD ripping speed. And the 3-Level hardware accelerated DVD ripper can make DVD conversion 5X faster speed than normal DVD rippers. 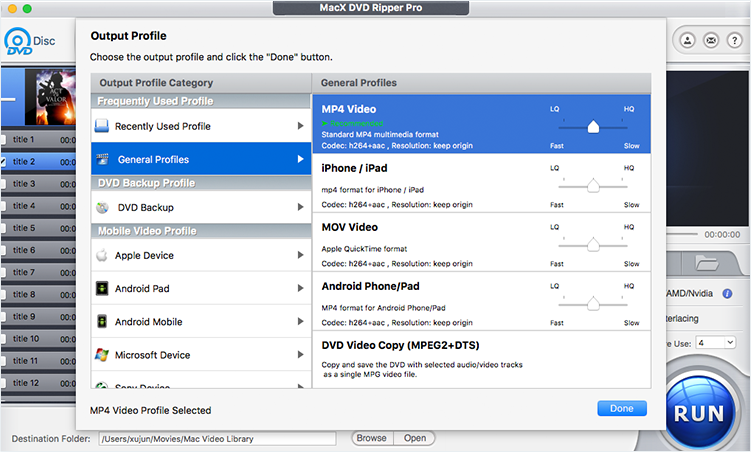 Currently only MacX DVD Ripper Pro delivers 3-level hardware acceleration performance in DVD ripping and converting, which beats the pants off its competitors like Wondershare, Movavi, Any Video Converter, DVDFab and Handbrake. Just as the old saying goes, "oral expression in words cannot be taken as evidence". To be objective and persuasive, here we round up the HW acceleration techs that 6 popular DVD rippers adopt and analyze the capabilities of different GPU HW acceleration techs. What's more, we conduct two DVD ripping tests (homemade DVD & commercial DVD) to let test data speak for themselves. It's clear to see that there is no big difference among the GPU hardware acceleration techs the DVD ripper programs adopt. 5 out of 6 DVD rippers (except Any Video Converter) support Intel Quick Sync Video acceleration tech; 4 out of 6 DVD ripping tools have the power to activate Nvidia (CUDA) HW acceleration on your computer and 3 out of 6 DVD copy software work seamlessly with AMD GPU graphics card to boost DVD ripping speed. And only MacX DVD Ripper Pro gives strong backing to latest Nvidia (NVENC/NVDEC) GPU hardware decoding/processing/encoding tech. Which Nvidia GPU acceleration is stronger, CUDA or NVENC/NVDEC? The answer is NVENC/NVDEC. To be specific, CUDA does it duty via hybrid processing (CPU + CUDA) while Nvidia NVENC is fully hardware accelerated, no burden to place on CPU. What's plus, the performance of CUDA is greatly affected by CUDA cores while NVENC provides high performance with lower power, barely no demands on CPU/GPU & bandwidth/memory. BTW, Nvidia NVENC is responsible for DVD movie hardware encoding and NVDEC accounts for DVD movie hardware decoding. And generally speaking, the capability of GPU hardware acceleration can be ranked like this: Nvidia (NVENC/NVDEC) > Intel QSV > Nvidia (CUDA). As for AMD and DXVA, you can compare them via actual DVD ripping speed test if you feel curious about them. Owning to the revolutionary 3-Level hardware acceleration techs, now the DVD ripping process is conducted more on Intel QSV/Nvidia/AMD GPU than on the computer's CPU. Therefore, the ripping time is greatly shortened and more CPU resources are spared for gaming, web browsing, etc. In our test, the average conversion frequency of MacX DVD Ripper Pro reaches to 320 FPS during DVD to MP4 H.264 transcoding. That's nearly 2-4X faster than the other rippers including Handbrake under the same test condition with the same settings, leaving the competitors in the dust. Below is the side-by-side DVD to MP4 conversion speed test between the top-rated DVD rippers for Mac. So far, nearly 90% of DVD discs are encoded with copy protection schemes that are hard to crack with generally DVD ripper for Mac. These discs include the latest DVD movie releases such as I Am Wrath, Manchester By the Sea, Zootopia, the 99-title DVDs like workout discs, and some other DVDs with formatted dissimilarly to UDF like the AV DVDs that even VLC cannot play. So in our fast DVD ripper test, we also go ahead the speed test with I Am Wrath which is talked most regarding to DVD ripping. Just check the comparison below. 1.Cannot choose the right title. Besides the speed test mentioned above, we also list other factors users concern most when selecting a right DVD ripper for Mac. Here is the side-by-side specs comparison among these most-favored Mac DVD ripping software. Owning to the powerful transcoding engine, hyper-threading tech, multi-core CPU, coupled with the innovative Intel QSV/Nvidia/AMD GPU hardware acceleration technology, MacX DVD Ripper Pro is marked as the fast DVD ripper for Mac, and its ripping speed reaches a new height. Additionally, its ability to support all types of DVDs and always the first to crack new DVD copy protections, conquer new discs, along with the intuitive interface, makes MacX the easiest, best and fastest DVD ripper for Mac. You can follow the step-by-step guide to learn how to fast rip DVD on Mac in 5 minutes. Load the DVD by clicking Disc, ISO image or Folder. It will read and load any DVD quickly, be it homemade or copy protected DVD. Choose the output format from drop-down window. Here we recommend you to choose MP4 H264 to fast rip DVD. Check the Intel/AMD/Nvidia box at the lower right of the interface to enable hardware acceleration. Hit the "Browser" button to save the output video and click "RUN" to start ripping. 1. You are advised to download the latest version MacX DVD Ripper Pro V6.1.1 to enable the 3-Level hardware acceleration tech. 2. The GPU HW acceleration tech is available for H.264 codec only, so far. Therefore, you can rip DVD to MP4, MOV, M4V and other H.264 encoded format to ensure the fast ripping experience. 3. The newest driver is necessary for a fast DVD ripping. 4. The computer configuration and size of DVD have a lot to do with the ripping speed. There are altogether 4 tips to make your DVD ripping process faster on Mac. 1. Choose the fastest DVD ripper. A fast DVD ripper is a decisive factor in the quick conversion. You can choose the fast one according to the test performance mentioned above. 2. Upgrade your computer configuration. Highly configured computer will give rise to faster ripping process. You're suggested to update OS X to macOS High Sierra and expand RAM up to 8GB. 3. Make full use of GPU and CPU encoding. If your Mac has Intel processor, choose the DVD ripper supporting Intel hardware encoding/decoding tech. Generally, the speed will enhanced up to 5x faster, even on a slow computer. This makes the ripping process conducted more on GPU than CPU. Plus, if your DVD ripper makes full use of CPU cores, the ripping speed will be doubled and maximized as with both GPU and CPU encoding. 4. Backup or copy a DVD rather than encoding a DVD. In computing, hardware acceleration is the better use of computer hardware (generally GPU graphics card, hard drive, RAM, CPU multiple cores, etc.) to perform some functions faster than is possible in software running on a more general-purpose CPU. 2. Using the Quick Sync tech, the DVD ripping can be switched over to the graphics unit, thus freeing up the processor to be used for other tasks. Q. What can you benefit from Intel QSV-enabled MacX DVD Ripper Pro? 3. Unbeatable conversion speed: By courtesy of Intel QSV technology, MacX DVD Ripper Pro delivers up to an twice increase in performance compared with the normal edition and proves to be 2-4 times faster than competitors regarding to DVD conversion. World's No.1 fast DVD Ripper for Mac. 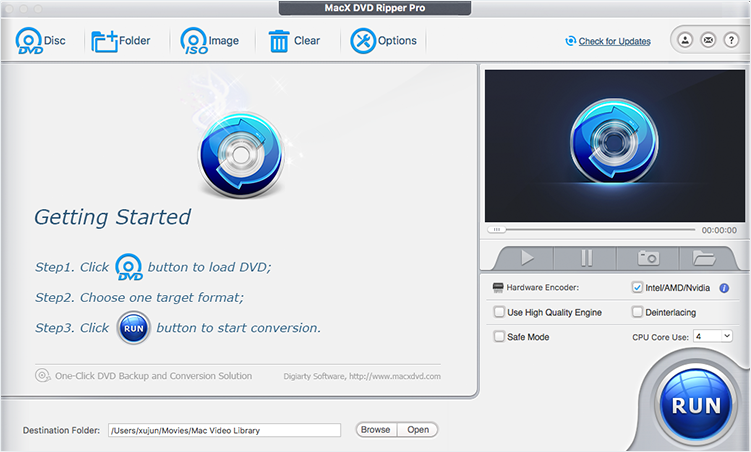 MacX DVD Ripper Pro makes full use of Intel Quick Sync Video technology to rip DVD on Mac as fast as possible. This option is selectable on Macs equipped with a Sandy Bridge CPU 2nd Gen Intel Core i3, Core i5, Core i7 Processor or higher. And make sure you've upgraded your Intel processor driver to the latest version. You can find the newest version at Intel's official website here>>. We recommend only downloading drivers and other software from trusted sources. Q. Any difference between Nvidia NVENC and NVDEC hardware acceleration? Nvidia NVENC, a dedicated part of your GPU, specilizes in encoding video only. That means NVENC will stay idle as long as the task is irrelavant to video encoding. Nvidia NVDEC has a good partnership with NVENC, dedicated in video decoding to offload heavy computing burden from CPU. To make sure whether your computer supports Nvidia NVENC/NVDEC hardware decoding & encoding, please have a check on this Nvidia GPU Support Matrix >>.